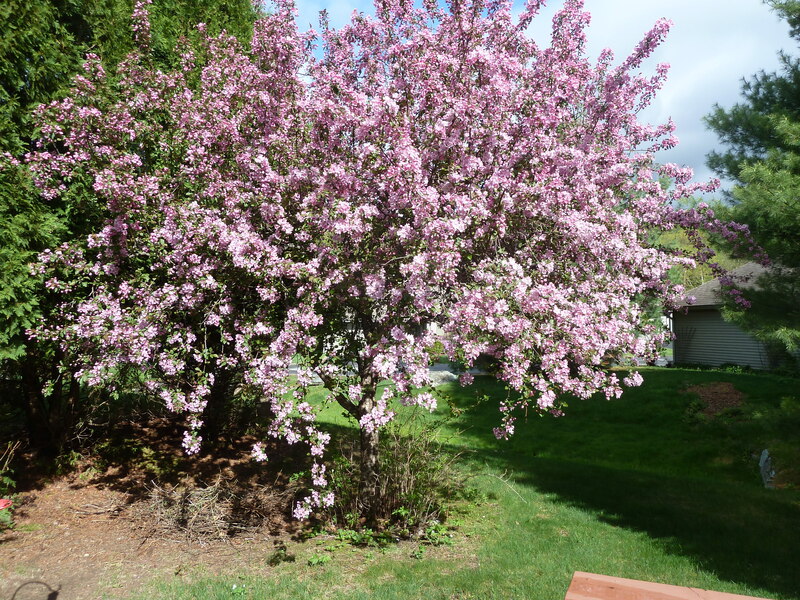 Every spring, the crabapple trees that line the streets of this neighborhood burst into spectacular pink and white bloom. This is how the tree behind our house looked last May. It turns out the trees have other uses aside from the landscaping purpose for which they were intended. After the blossoms have passed and the fruit starts to ripen, the trees become a sort of natural wildlife feeder, providing us with a wildlife show on our back deck. They provide food for us humans, too — a sort of accidental edible landscaping. This is how the tree behind our house looks now. While the fruit was ripening all summer, I was planning and researching ways to eat it. 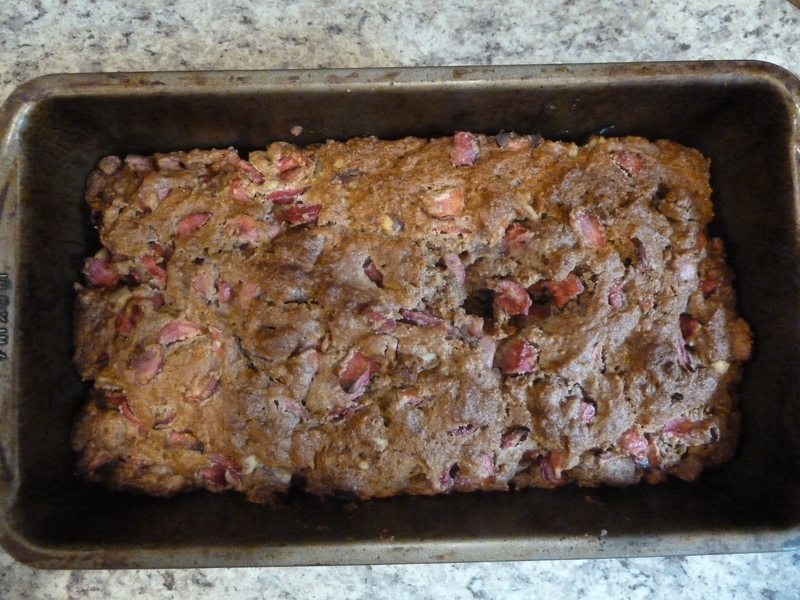 Now that it’s ready for picking, I conducted my first crabapple experiment yesterday — crabapple bread. Here’s the recipe. Cream the butter and sugar, then beat in the eggs and milk. Mix together the dry ingredients. Combine the dry ingredients with the wet, then fold in the crabapples and walnuts. Bake in a greased loaf pan at 350 for 50-60 minutes. I found the easiest way to core this small fruit was just to cut around the center of it as I chopped. You need to do this because you don’t want the seeds in your bread. It came out quite tasty, if a bit crumbly. I think I might try chopping the fruit a bit smaller next time. On the agenda for future experiments: crabapple sauce and crabapple butter. Please share any ideas you have for cooking with this tasty fruit. 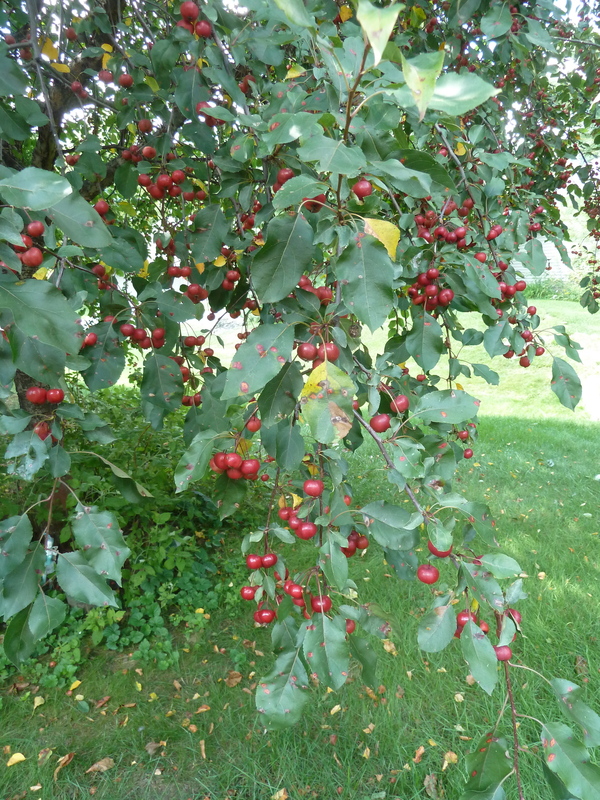 This entry was posted in fruits and tagged baking, crabapples, critters, recipes. Bookmark the permalink. It was very yummy. The walnuts balanced out the tart apples.